I'm pretty sure we haven't actually seen and official logo for this, though, we all knew what it would look like. 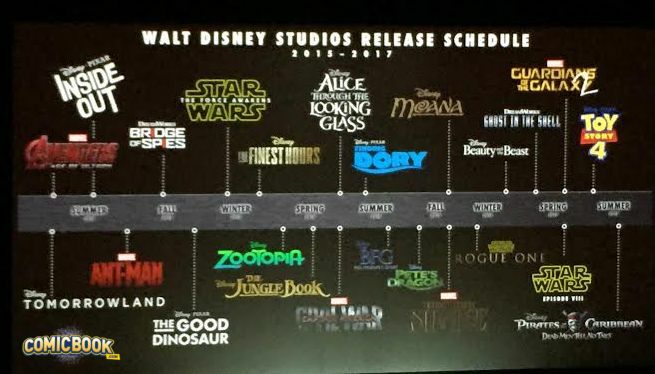 This is from the Disney panel at CinemaCon. Well, I guess we did a pretty decent job when we mocked up a quick logo after the announcement. We even got the angle down...but, I guess we shouldn't pat ourselves on the back too hard since (like you said), it's what we expected it would look like! Excellent find though - thanks for posting that! I thought they said Dreamworks, too, but Dreamworks' slate has none of those titles on it, so it might just be the fuzzy picture. Unless they have a live action division I wasn't aware of. Edit: Oh, hm, I was wrong. I do not really have anything to say about the TS4 logo-- it is exactly what we expected and it is good. Vellerie, the two Marcel films you are talking about are Captain America: Civil War and Doctor Strange. In that left to right order. Disney are releasing the DW movies in North America. This is so EXCITING! It is a little weird to see Star Wars and Marvel titles on there. It's more a fight between two groups that are sort of led by Iron Man and Captain America, at least as far as I know. Thank you! I just looked up Doctor Strange and it said Benedict Cumberbatch is playing him, interesting. Yeah, I know Bonnie, I was just trying to not get into too much detail. I tend to go overboard. Comics have become my new obsession while Pixar has been on hiatus. You too? I've become a big Image Comics fan myself! I really enjoy East of West, Saga, Rat Queens, and others. That is the official logo for Toy Story 4. Looks pretty good, right? Heh heh, not bad, not bad at all. I like it. Logo looks great!!! Every new bit of information gets me more and more excited for this film!